EA Sports ™ has announced that there are two new titles available today for the Sports Active franchise, which has become the top rated interactive fitness training title for the Wii (Metacritic.com, November, 2010). EA Sports Active 2  is now available in North America and will be available worldwide on November 19th. EA Sports Active 2 is a new suite of digital fitness programs available on multiple gaming consoles focusing on improving muscular strength, endurance and flexibility, while providing an intense cardio workout. A recent study conducted by the University of Victoria in British Columbia concludes that EA Sports Active 2 workouts meet recommended exercise guidelines for exercise intensity and caloric expenditure put forth by public health guidelines, including the American College of Sports Medicine (ACSM), the leading authority on exercise science in North America. EA Sports commissioned a study of the EA Sports Active 2 Mountain Gravity pre-set workout to determine the efficacy of its product line. The study tested 15 physically active adults between the ages of 23 and 33 to determine the relative exercise intensity and caloric expenditure of EA Sports Active 2. Results of the workout met both the ACSM guidelines for effective physical fitness, which recommend that individuals exercise at an intensity between 64 per cent and 94 per cent of their maximum heart rate or 40 percent to 85 percent of their maximal oxygen consumption (VO2max), as well as burn a minimum of 200-300 calories per session, five days per week, in order to maintain proper fitness and to aid in weight control. EA Sports Active 2 will feature more than 70 new exercises and fitness activities including exercises not possible before the Total Body Tracking wireless control system. Using heart rate data that is displayed on-screen, users will be able to capture the intensity of their workout, allowing them to optimize their performance and reach their fitness goals more quickly. A new 9-week program provides a fitness roadmap to keep users motivated and on track to achieving their fitness goals. Users will also have the ability to download new workouts and exercises to their online connected PlayStation®3 and Xbox 360® systems to keep their workouts fresh and maintain motivation (Internet connection and EA account required). 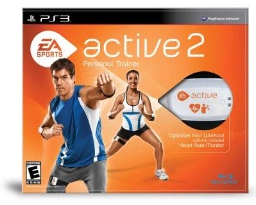 EA SPORTS Active 2 is available on PlayStation®3, Kinect™ for Xbox 360® and Nintendo Wii™. The title will be available at a later date for the iPhone® and iPod touch®. EA SPORTS Active 2 has been rated “E” by the ESRB and has an MRSP of $99.95. 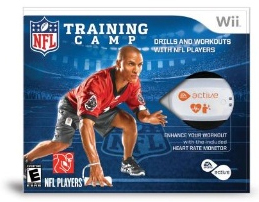 EA Sports™ has also announced that EA Sports Active NFL Training Camp for the Wii™ is available in retail stores across North America. EA Sports Active NFL Training Camp is a football-based training program that simulates the football drills and conditioning workouts of an NFL training camp. Developed in collaboration with NFL strength and conditioning coaches, users will experience the thrill of competition while challenging friends and family in authentic NFL football drills. EA Sports Active NFL Training Camp with Total Body Tracking includes a heart rate monitor and wireless motion tracking that delivers an accurate, challenging workout with measurable results. Users can also track and share training results via the EA Sports Active online hub. EA Sports Active NFL Training Camp delivers an authentic NFL experience that is fun and engaging, while providing a challenging workout. It includes over 70 drills and challenges designed to improve strength, power and conditioning, as well as reaction skills, agility and first step quickness – key areas of focus for NFL players. Users can train in the environment of their favorite team, as they step into their stadium and train alongside their favorite players. EA Sports Active NFL Training Camp provides a fun, competitive experience where users can go head-to-head in multi-player mode in NFL training camp drills such as the QB Window Challenge and Field Goal Challenge. For further challenge, users can get their game on in the NFL Combine 60 Day Challenge, a progressive exercise program that provides total body conditioning. In addition, as part of NFL PLAY 60, the NFL’s commitment to youth health and fitness, kids and families can choose NFL PLAY 60 drills and exercises, specifically designed for them. EA Sports Active NFL Training Camp joins the EA Sports Active 2 suite of interactive fitness products that focus on improving muscular strength, endurance and flexibility, as well as improving cardio. EA Sports Active 2 is in stores today in North America on the PlayStation®3 computer entertainment system, Kinect™ for Xbox 360® video game and entertainment system from Microsoft and the Wii. EA Sports Active NFL Training Camp is rated “E” by the ESRB and has an MRSP of $99.95.